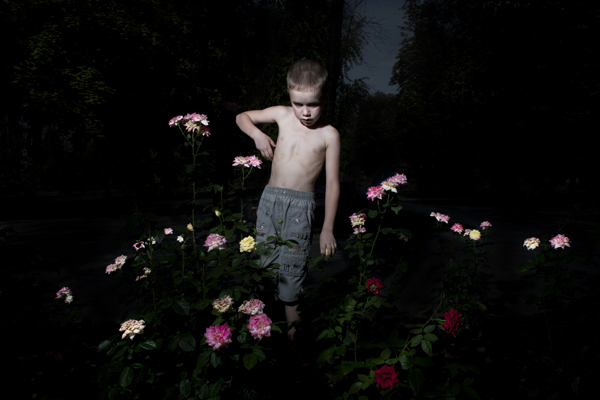 Series Boys in a City Park was an evolution from the images of injury photographed in the Hospital Gardens in and around Donetsk, Ukraine during a summer residency in 2011 with IZOLYATSIA Foundation for Cultural Initiatives. The broken limbs in Hospital Gardens were an overt metaphor for an emotional fracture, but I was seeking an evolution towards something beyond that and less easily defined; a hidden damage. My assistant and translator Yulya Shato contacted some different mental health organisations in Donetsk, one of which was a small support group for parents of autistic children. We arranged to meet them in a park in the centre of Donetsk. It was a blisteringly hot and sunny day; close to 36º. When we arrived at the park, nothing seemed 'out of the ordinary', people were going about their business and children and parents were playing on the swings and sandpits. We waited for sometime before realising that the parents and children playing were in fact our potential subjects. As we introduced ourselves I watched the children and could not see any indication of their condition or how it might visualise itself. Only at the point of shooting, exposed to the camera, did the extraordinary complexity of autism as a relative condition reveal itself. During the impossible battle to position the children, their detachment from our reality became startlingly and movingly evident but it was only in hindsight, viewing the chaotic frames, that some of their intimate world was exposed. 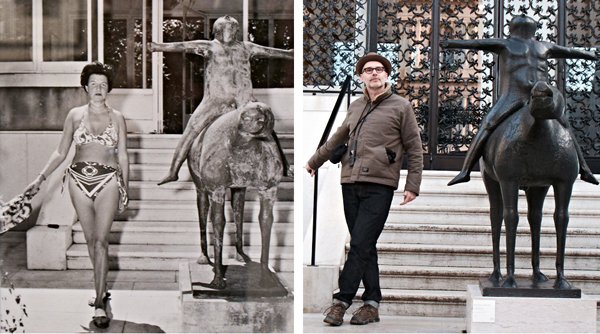 Many thanks to Arte Laguna Prize 12.13. Here's a copy of the flier for the upcoming show of two separate but related new projects. 'Untitled' showing in the ground floor space is not a cop out title, it literally does not have a title or narrative in the conventional sense; it takes inspiration from Irving Penn's 'Women of Rissani, Morroco, 1971'. On the lower ground floor we are showing 'Lion Hunting in Essex'. 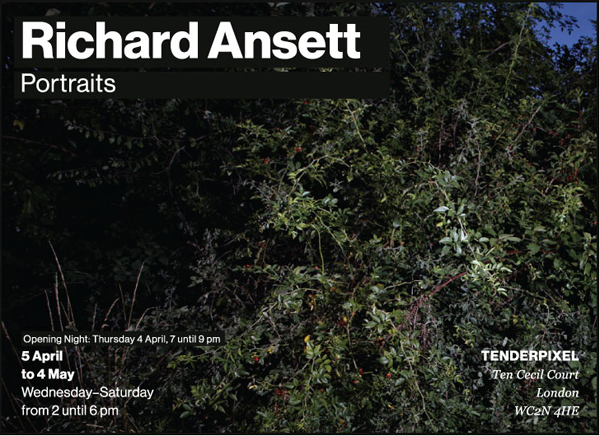 Opening night is Thursday 4th April. 7-9pm. All welcome. It feels like I am constantly being reminded that it is now 10 years since the start of the war with Iraq. I do not want to disrespect the suffering of the Iraqi people so I'll get some statistics out of the way first. This anniversary partly can give us time to reflect on where we were then and the politics that bullied us into such a doomed conflict.The events leading up to the invasion culminating in the tragic and shocking death of Dr David Kelly, still resonates with me like something out of Stalin's Russia. In 2010, I was asked to photograph the journalist Andrew Gilligan, we had arranged to meet outside a major Mosque in east London as part of story about Muslim extremism but he didn't show. It transpired that he was still in bed with the flu and had completely forgotten about the shoot. With some reticence he agreed to allow me to come very briefly to his home, as the press deadline was the next day. When I arrived, I was greeted by the poorly fellow and was shown into his lounge which was a mess of books, papers, empty sweet wrappers and fizzy drinks bottles. It is an enormous privilege and buzz as a photographer to see the unrefined reality of someone else's life, there is much to learn from it. He sat for me for 10 minutes and I left. 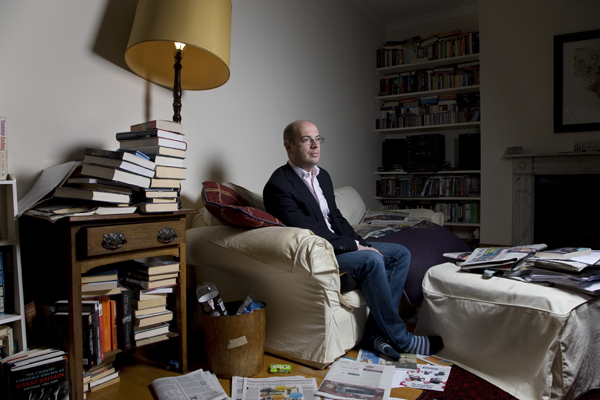 I have always expected that Gilligan's role in the Iraq conflict would make him more of a celebrity but it seems he has quietly been working as a journalist in relative obscurity ever since his dismissal from the BBC. I did feel I was in the presence of an important protagonist that gave the government and especially Alastair Campbell a sharp poke in the ribs. I still believe history might make more of Gilligan but all the players in this grubby affair will never be able to completely wash away the blood whether it is Iraqis' or Kelly's. They are rather macabre celebrities. The National Portrait Gallery, London has a very dogmatic approach to its acquisitions; the subject must have earned their place in some way that they decide. Often it is celebrity that attracts their interest or those who have achieved some greatness in their field. It is an indication that I am not alone in my feelings about Gilligan and therefore no accident that they deemed his image worthy of a place in their historic collection. 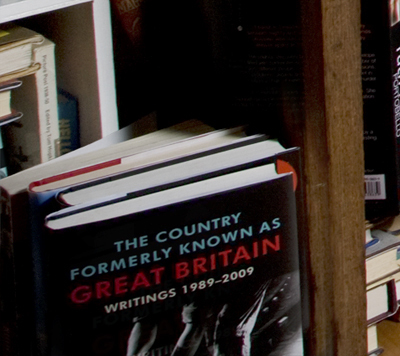 In the bottom left hand corner of the image by entire coincidence is the book 'The Country Formerly Known as Great Britain'. by Ian Jack.